I haven't had time to look at the widescreen mod, but with that we should be able to have widescreen as well. unfortunately i don't know how we might be able to do this in the remastered, but it can easily be achieved in residual. Amasing. What was the problem with the first try, how did you solve it? It looks like Z-buffer is stil in low res, is there any way to make a new z-buffer image in high res? Oh, and, how much time did you spend making the scene in 3D? My first try was on the remastered version and i was not able to get that version to scale properly, residual had the same issue. so the way residual works is that, when the resolution is changed it scales the background from 480 to the new resolution regardless of the size of the image, I changed it so it will scale based on the resolution of the image. the z-buffers work the same way so it should be fairly easy to change those as well, i have access to the z-buffer when i render the image so i just have to convert it to a format that residual understands. the modelling didn't take that long, maybe 2-3 days, but i still haven't done any of the textures and that is what is hard for me, I'm not that experienced at 2D so that part is going to take longer. The big problem in the Grim Fandango backgrounds in my view is the noise.It is purposeful effect? No, those are compression artifacts. But unlike JPG, these are GIF-like. It's called dithering. Cool, thanks for the info, but what is necessary to remove it? Original files It would be 2 sec job to re-export scenes in high-res & widescreen & full 32-bit colours... but not even DoubleFine has all the source files. Or at least they said so in first "Re-making GF" episode on their YT channel. One of the designers explicitly said: "Removing dithering is like removing JPG artifacts... and that's something I wouldn't like to do". There are a lot of techniques of minimizing the dithering effect, but it's not automated and would need to be done manually. Also the result is not perfect and a lot of image info would be lost - it boils down to blurring. Got it! Then in that case it would be better to leave the dithering. 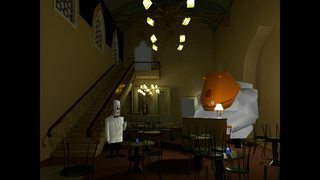 And another problem I see in the grim fandango animated backgrounds is the rigidity of the animation, they are made by image frames in some 2D right? It would be possible to add more frames so she could get smoother? It would require repacking LAB files. Each animation can be viewed as an image using ScummRevisited, only unlike static images (like backgrounds) animations have frames. I don't know much about LAB repacking but I guess adding more frames IS possible. But then you have framerate issues: adding frames but playing the animation at the old FPS would make it slower and not smoother. You would need to increase FPS too. And making more frames... well I guess there are morphing applications that could interpolate 2 images and make something in-between. But I haven't done anything like it. And I'm talking just about some small on-screen animations like doors closing etc. I'm not talking about video files which are encoded with Lucasarts proprietary SMUSH codec. Yes that's what I'm talking about, these animations as doors opening, etc. It would be a very good thing to do on remake of the backgrounds. How could I extract these animations, in what format are they? The background animation is actually smush video, like the cutscenes. God luck redoing those. It's not the scattered dithering commonly found in GIFs though - it is a fairly regular patterned dither. This means it's possible to calculate the margins of error in each colour value, and work out mathematically where smooth 24-bit gradients could be applied. It's probably not that easy, but it at least doesn't need manual work, and could probably be done on the fly in the engine without modifying the original images. Great work kavehth and Cervian! Are there any updates on this? Just now I am working of a special version of the LSA.